Installs alternative keyboard mapping schemes to work with Visual Studio. Brings to life all your favorite shortcuts from other editing tools. This extension makes use of the Keyboard Shortcuts Manager extension to detect and load shortcuts. A copy of the Keyboard Shortcuts Manager is included with this extension and will be installed and uninstalled with this extension if it is not installed separately. The extension will auto-update itself to the latest version on the Marketplace. On first load after installation, the Keyboard Shortcuts Manager will detect all the shortcuts definitions contained in this extension and will add them to the "Load Shortcuts" list in the Keyboard Shortcuts menu on the Tools menu. Once the shortcuts have been identified, you can load them from the menu. Tip: Use the Save Current Shortcuts feature to backup your existing shortcuts. The backed-up shortcuts will be added to the Load Shortcuts list. Each mapping file does a best attempt at matching existing commands from the respective JetBrains mappings. See the one-page PDFs of each binding set here. 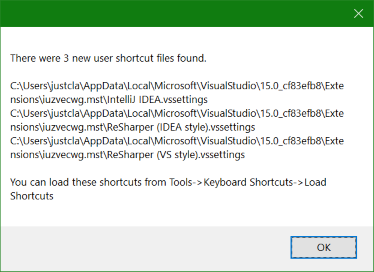 Many of the shortcuts defined by JetBrains cannot be mapped because Visual Studio has no equivalent command implemented. See the .vssettings files for details of each feature and whether there is a matching (or near-matching) command available. The mappings defined attempt to use the Hot Commands features if they are available. (ie. Toggle Comment is mapped to Ctrl+/ ) This will light up if the user installs Hot Commands for Visual Studio. There are some fixes and enhancements to Visual Studio command mapping that bring to life new functionality with the keyboard. For instance, Ctrl+Plus/Minus will expand/collapse regions in the editor. Alt+1 opens and closes Solution Explorer; Alt+9 = Team Explorer ; Alt+0 = Output window. I have fixed a bug so now you can use the standard Windows keys Ctrl+PgUp/PgDown to move to the next/previous document tab. I have hooked up shortcut keys for GoToNext/Previous member. ....And some other minor improvements. Enjoy the power of great keyboard bindings! Feel free to contribute to the project or leave feedback on the GitHub repo issues page.